When it comes to golf, individuals know that there is no other sport that requires more walking, unless you are just walking. With that in mind, golf can be one of the most entertaining and advanced sports in the world. However, nothing is less fun than having to haul a golf cart bag in 95-degree weather. Therefore, we want to make life a bit more simple for our readers by sharing the top ten electric golf trolleys that an individual can buy today. This trolley has a built-in auto-folding mechanism. The manufacturer designed this trolley perfectly with weight distribution at the forefront of the construction. Easy for golfers to manuever on a golf course. Has a cup and umbrella holder. Convenient compartment for all belongings. Fixing it in the case that it breaks can be expensive. 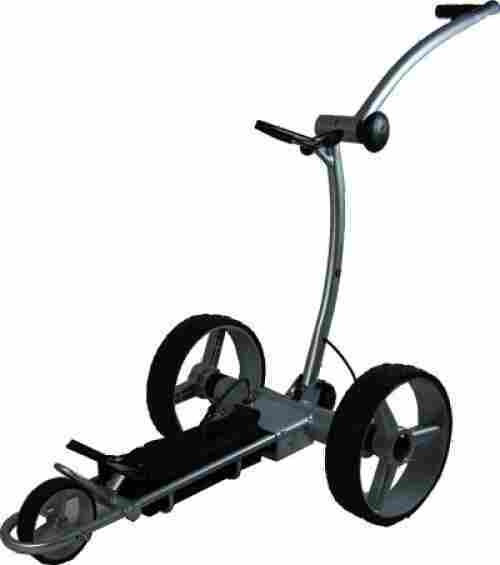 Golf trolleys can make life a lot easier for a golfer. Therefore, we are more than excited to share the first product on this list. Design with quality materials and intended to make it easy for golfers to push their golf bag, we want to talk about the GolferPal EasyPal, a quality designed trolley for the everyday golfer. Here are two features to consider of this item. When pushing a golf bag, have you ever accidentally pushed it too hard or tilted it too much to the point that it fell out of the cart? Well, with this push cart, that will not happen. This perfectly designed trolley has a distributed design that distributes the weight of the bag across all of the wheels. Therefore, it makes pushing and pivoting very easy for the individual, making the process more seamless and effortless. This item happens to be the world’s first powered auto unfolding and folding golf push cart. In fact, this brand is the first to design a product like this excellent machine. With technology such as this, it makes it easy for an individual to fold and unfold the push cart automatically without any straining or difficulty. As we discuss cost and value for the first item on this list, we are surprised by the fact that the price has dropped by well above 50%. With that in mind, it is a well-priced item that removes a lot of the hassle of pushing and carrying your golf bag. This trolley, alongside all of the features, is well designed and crafted from quality materials. For the price, if you are a daily golfer, we can say it is well worth it. Remote controlled caddy that is very easy to use. Durable material quality with a 200w motor. Hand held remote option is well designed. Many different functions such as reverse and left and right. 120 yards remote distance max. Low maintenance tires that are puncture resistant. Individuals have mentioned that the customer service is poor. The range of the remote is less than advertised. This next item happens to be one of the most advanced when it comes to an electric trolley. Imagine not having to even push your golf cart bag? Well, this electric golf cart makes it easy for a person to do so and enjoy a day of golf all day long. Here are two features of the Spin It Golf Products Easy Trek. Imagine how simple your day would be if you did not have to push your own golf cart bag? Well, this remote-controlled caddy makes it easy to do so. For example, with this remote-controlled item, an individual can choose from preset speeds, left, right, reverse functions, and stop. Therefore, at the press of a button all an individual has to do is follow along or let the trolley follow the individual. One of the best benefits of this product is the durability. It is not only designed to last but it is designed to be highly durable. For example, this product comes with airless rubber tires. The rubber tires are designed to be puncture resistance and flat-free. Meaning, since they have no air, they cannot go flat and have enough traction for grass, concrete, and other different surfaces. The cost of this product will differ depending on the buyer. However, it is well designed and offers plenty of benefits for the person that may not be able to push the golf cart caddy or needs extra help. The remote-controlled option allows an individual to enjoy their day golfing without having to haul a golf bag around. With that in mind, it can be costly, compared to the last item on the list. But, convenience tends to cost a bit more. Comes with a free accessory pack. Designed to make pushing a stand bag easier. Well designed and durable construction quality. Comes with a cup rest. Certain plastic parts can make it feel cheap. This next product has been in production for many years and is known as the 10th model from this particular brand. What may be considered the competition to almost all electric caddies, this is one of the best designed electric trolleys in the industry. Let’s talk about the Bat Caddy X3R Electric Golf Caddy and what individuals can expect from this particular item today. After producing ten models, this brand has mastered the art of material durability and longevity. 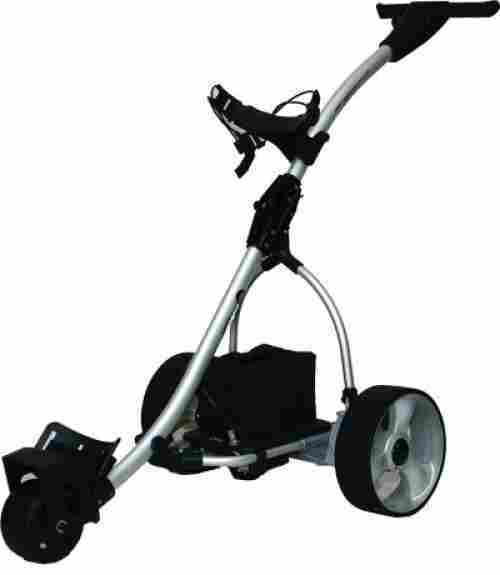 This golf caddy comes with a lightweight aluminum frame that is highly durable and made from very tough stainless steel. With that, it also comes with a polymer component to enhance the quality of the overall item. This particular product is a well designed electric machine that can be used both automatically and manually. Meaning, if you ever run out of battery, an individual can easily and effortlessly push the golf cart caddy around with ease. This product has two different batteries, a 35Ah sealed lead acid battery and a long-lasting lithium battery designed to give you hundreds of hours of pushing. Before we dive into cost and value for this item, it is important to note that this happens to be one of the leading brands in the golf trolley industry. In fact, they have designed numerous different versions of the golf trolley, but this one happens to be the best one. For the price, it is well worth it, but keep in mind you are buying a valuable and highly durable electric machine designed to enhance your golfing experience. Made of a durable aluminum body. Free accessory pack with this item. Can be used in manual mode. Speed control can be difficult to use. 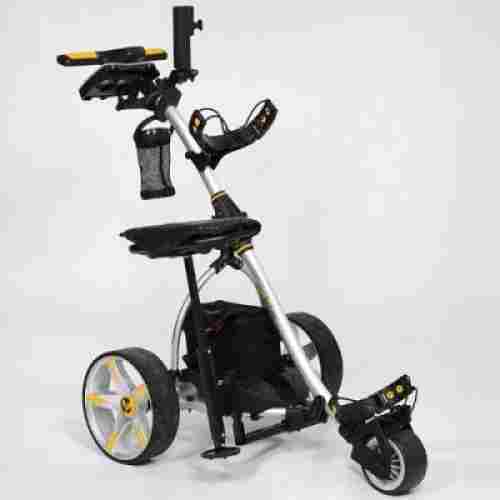 Known as the newer and younger brother to the last item on this list, we want to share the Bat Caddy X4 Electric Golf Caddy, which happens to be the newest and most innovative manually controlled caddy in the industry today. 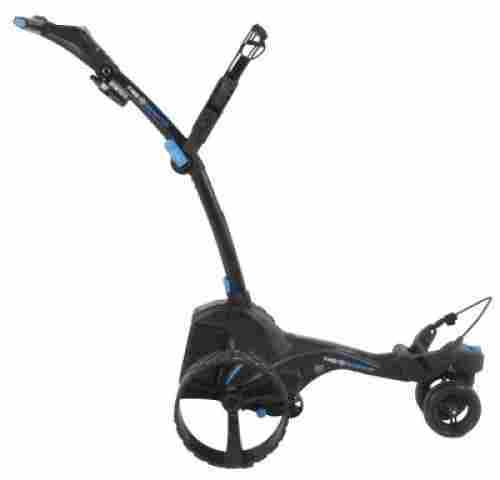 This product features many lightweight material qualities and benefits, and although it is lacking a few features, it is well designed for the individuals that want a simple caddy with not too many bells and whistles. Much like the quality products that this brand produces, this happens to be one of the best-designed caddies in the industry. The frame of this product is a very lightweight and high-tech aluminum frame that weighs about 18lbs. Alongside this, it has an easy to set-up two-step design that allows for easy storage as well as use. This brand happens to be one of the best in the industry and in fact, they are the most trusted in the motorized push cart industry. With that said, this product is well designed and boasts some of the best features this brand offers such as a quality cup holder, durable design, and frame, easy to understand instructions and excellent customer service. When it comes to cost and value for this trolley, it is much cheaper then it’s spec’d out big brother while offering some of the best design elements in the industry. The frame is lightweight, it is easy to set up, it has cruise control, and can be used even when out of battery. Overall, we highly recommend it for the benefits and material quality alongside the competitive price. Designed with a durable aluminum technology housing. Quality remote control with many features. Highly durable with stop and go features. No action from the individual, just walk and it will follow you. Battery may run out if in constant use. Now that we have come to the middle of this list, we are highly intrigued and enamored with this next product. With a hefty price tag, which we will discuss later, this happens to be one of the most technologically advanced and innovative electric carts in the industry. Here are two special and unique features of the Stewart Golf X9 Follow Electric Cart. It has the word “Follow” in the name for a reason! This particular item has a Bluetooth technology feature with sensors that follow the individual no matter the direction he or she is going. Yes, you can walk in front of this golf cart and the cart will follow your movements and stay up to pace with you. Features such as this are innovatively designed to make life a bit simpler. When it comes to the technology behind this item, it is in fact superb. For instance, this product comes with a four-wheel chassis that can go down hills and uphill easily. In fact, the item has a rear stabilizer which enhances the overall experience. Alongside this, it has automatic breaking and slow down features to ensure that your clubs and golf bag are safe when in travel mode. The cost and value for this item is superb. Yes, the price is known as the most expensive item on this list but for the amount of innovative technology and value, we can say it is well worth it. In fact, the only downfall of this item is the price. It has close to five-star reviews and it can easily handle any course that it travels on. If you want the Rolls-Royce of the golf trolley industry, this is it! Lightweight body and compact design. Powerful enough to climb hills and slope. Lithium-ion battery is highly durable. Quick five second folding design. Now that we have introduced many different golf cart trolleys, let’s talk about one of the simplest electric golf carts in the industry. This is the Spitzer EL100 Lithium-Ion Electric Golf Cart and here are two unique features from this quality machine. When it comes to simplicity, this may be one of the best and most simple items on this list. For instance, this golf cart trolley comes with a quick five-second unfolding and folding frame which makes it easy for an individual to take out and store it away. Alongside this, the dual tubular motors can easily maneuver around hills and rugged terrains. Part of what makes this item so simple to use is the technology. For instance, this product comes with a powerful and easy to climb uphill feature. It also is lightweight and compact, making it easy for an individual to use it all day long and not get tired. Lastly, the battery is intended to last a full 18-hole course without any complications or problems. As we discuss cost and value for this trolley, we can say it is designed very well and boasts a durable body and frame. Although it is lacking in many features, it is still highly durable and offers a quality speed control and weight distribution when it comes to the golf bag positioning. For the price, individuals should consider many options, but for the value, it is well designed and simple to use. Four-way direction and variable speed control. Optional manual controls and speed. High capacity and durable battery. Quality aluminum body that is very durable. The rear wheels have been mentioned to be bad quality. Scorecard, drink holder, and umbrella holder are made cheap. As the older brother with more experience and features, we want to talk about the Spitzer R5 Digital Remote-Control Trolley, boasting with many different specs compared to the last one we just talked about. Here are two great and unique features of this product. Unlike the last trolley on this list, this one comes with full remote functionality. With this remote, an individual can control the trolley in four different directions and use a variable speed control. In fact, this trolley boasts a variable speed control readout screen from the LED screen by the handles of the trolley. With this feature, an individual does not need to push the cart, her or she can simply control it by remote. The battery power of this trolley happens to be more durable and longer than the last trolley on the list. The battery of this product can actually last for 36 holes compared to numerous trolleys that can only last for 18 holes. With that in mind, the battery is rechargeable, making it easy for individuals to charge it overnight and use it the next morning. The cost of this trolley happens to be a bit more than the last and that it is because it boasts many different features. Many of the features are considered quality features from premium trolleys and are known to make golfing a bit simpler for the golfer. Giving you more freedom to move about the course, we highly recommend this pushcart if you want quality and longevity from your cart. Designed for durability and functionality. Powered by a large and powerful battery. Safely keeps golf bag in place. May be difficult to learn at first. Can be bulky to store. Let’s once again talk about one of the big boys in the industry. This next golf cart trolley is designed with some of the most innovative technology in the industry and has some of the best material quality available today. 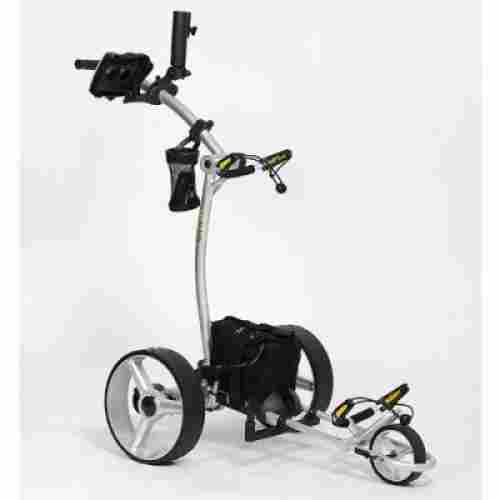 This is the MGI Zip Navigator Remote Control Electric Golf Caddy and here are two features this product comes with. The overall control quality of this product happens to be one of the best. For instance, this item comes with a downhill speed control which minimizes the speed and movement of the trolley when going downhill to ensure that the golf bag is safe. Alongside this, this product comes with a full multi-directional remote that allows for speed control and even reversing of the golf caddy. Part of what makes this item one of the best is that it comes with a twin-calibrated motor that is perfect for power and agility. Alongside this, this item is powered by one of the strongest and most durable batteries in the industry. This trolley comes with a lithium 24V 380Wh battery that is rechargeable and highly durable for plenty of hours on the course. As one would expect from such a quality brand and item, this is considered one of the top three most quality filled and innovative trolleys. Not only does it fold to be compact, it is highly durable, and basically does all of the manual work for the individual. With fully directional remote controls and technology that ensures it can go up against all terrains, this is well worth it if price is not a concern. Variable speed control with a last speed memory function. Distance control function with a ten second timer. Adjustable handle that can fit to any individual. Durable construction quality with well-designed wheel structure. Not as attractive as other trolleys. We are coming close to this list and we want to share a golf trolley that is simple and designed for the maximum comfort of the user. This trolley has many features from quality premium trolleys while also being simple to use. 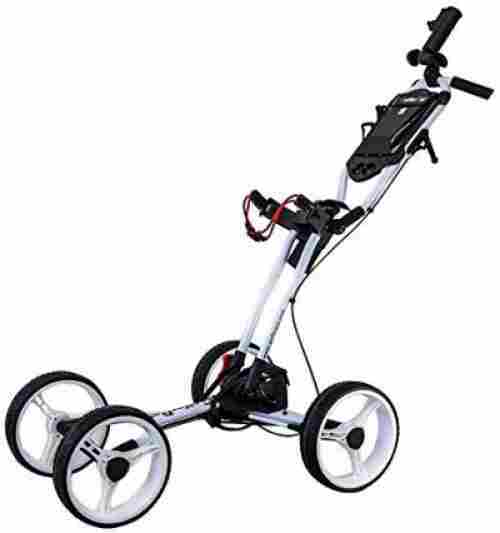 Although it is not as attractive as other carts on this list, let’s talk about the CartTek GFX-965LiB Silver Electric Golf Trolley and two features individuals can expect. This is a new feature that we have not talked about yet. The handle of this particular item is actually adjustable, making it easy for golfers to adjust the handle so they can get a better grip on the product. The level can go as low as 36” and as high as 45” for taller golfers. Alongside this, it has great grip designed and a sturdy aluminum structure and frame. As we have come to know from more high-end trolleys, they come with many different control functions. This one, in particular, comes with a variable speed control and a last speed memory function which makes it easy to use. Alongside this, it has a distance control function where an individual can easily set the cart to go out on a ten-second timer. The cost and value for this product happen to be one of the best. In fact, it is well designed, boasts a durable frame, and is structured to be easy to use and compact. Although it is not as appealing as many other golf trolleys, it still has the technology to compete with other trolleys and manufacturers. For the price, it is considered somewhat pricey, but it is worth if you like the design. Dependable tire quality with thumb wheel speed control. The steel may rust if exposed to water. As the last product on this list, we wanted to top off the list with one of the best-designed golf cart models in the industry. This model is known as the Kangaroo Model 5, which happens to have some of the best and most top-notch features of the industry today. Here are two unique features of this quality golf cart. This particular item has many different accessories that other trolleys do not come with. Other than the trolley itself, it comes with a battery and charger. Alongside this, the manufacturer has included a basket, a cup holder, and a scorecard. These usually are add-ons that individuals have to pay extra for, but with this brand, they are included. The design of this particular item happens to be one of the best for durability and longevity. This item comes with an electropolished stainless steel platform and tubing. Alongside this, the brand has included a polycarbonate-cast housing which is designed for long-term wear and tear. The overall weight of this item is about the same as a golf bag, making it more lightweight than most. As we discuss cost and value for this particular trolley, we can say that it is one of the most dependable and durable trolleys. Although the price puts it in the top three most expensive, it happens to be made from quality for longevity purposes. 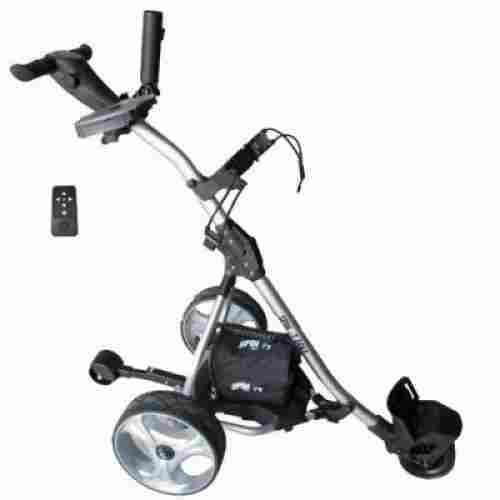 The wheels are puncture-proof, the tubing is excellent, and the functionality makes it easy for an individual to enjoy a whole day golfing. As we discussed in the intro of our article, there are many different styles of electric trolleys. However, the mechanism that moves the trolley can either be manual or automatic. Automatic is known as a remote-controlled trolley that does not need to be pushed, it simply follows the individual or can be controlled with a remote. However, a manual trolley does need to be pushed the whole time. With that in mind, we can say that remote control trolleys tend to be the fan favorite for numerous reasons. Reason number one is that they are simpler to use and give the individual unprecedented abilities and freedom when it comes to the golf course. Reason number two is because if the battery runs out, it can also be used manually and pushed so it is never stuck on the course. As point number two, we found that the technology behind a trolley is detrimental for the success of the overall item. First, the way the machine functions is crucial. Meaning, some trolleys are automatic but can only be controlled in a specific way, while some trolleys come with a remote control. It is synonymous however that most automatic trolleys come with a left, right, reverse, stop, and forward feature to make it easy for the user to use. Alongside this, the most innovative trolleys come with a slew of technology features such as automatic follow, which automatically follows the golfer through a sensor system. The second most innovative feature is the slope up-hill and down-hill feature which makes the cart more cautious. As the third point to cover, we wanted to ensure that the trolley came with the best possible battery. Now, it is important to note that if a trolley is more expensive it will come with a better-quality battery. For instance, many premium brands have rechargeable batteries that last as long as 38+ holes. However, some brands have batteries that need to be replaced after a specific amount of time. All of this together will help determine the overall cost of the item. As the last major point that we focused our attention on, we found that many brands will either include or have different accessories as options when it comes to their products. These accessories include everything from cup holders to scorecard holders. To us, we wanted to include both varieties that included the accessories as attachments or did not, but individuals had the options to buy them separately. We wanted to make sure that the products we put on this list were easy to use for whenever you need it. Having an electric trolley makes golfing a lot easier and keeps you from putting strain on your shoulders from carrying your golf bag. We also wanted to make sure that it can be packed up into and out of your vehicle so you can bring it with you wherever you go. Not only that we also looked to see how you use them. Are they remote controlled, sensory operated (where you wear a sensor and then the trolley will follow you automatically) or manually operated? No matter what one you get it will help you conserve your energy for your game. Some are easier to use than others but, most of them require basic technology skills. Some even come with a distance timer where the trolley will move the designated amount and then stop automatically. This feature really comes in handy because if you leave your trolley on the side and go to hit your ball in the middle of the course you don't have to walk all the way back to get it because you can set it to come right to you instead. The best golf bags to use with a golf trolley are your standard golf bags with an even oval on the bottom. Put a bag with legs or one that isn't sturdy on the bottom, and it won't distribute the weight evenly. Most standard golf bags are an average of 45 inches, while 35 inches is the smallest most trolleys will hold on to. This is something that is on a lot of our lists because we want to make sure that the items on our list are of good quality materials. We included items that will be worth every penny you spend on your new golf trolley. Nobody likes purchasing something and then have it break or fall apart after using it one time and find out you just wasted all that money you spent. Especially with a bigger purchase like this you want to make sure what you're buying is going to last for a long time. q: Can the trolley get wet? As one of the most frequently asked question, the primary answer is no. Although some trolleys can be water-resistant and handle a bit of rain. Many different areas of the trolley will be damaged as they are exposed to a lot of water. For example, if the trolley is made of aluminum or stainless steel, it will rust over time and begin to brown because of corrosion. The second and worst aspect of a trolley if it gets wet is the battery and the electric wiring of the item itself. When wet, it might not function properly. q: How do I clean the trolley? The best way to clean a trolley is with a damp, almost dry towel. Since the trolley may corrode when wet, it is important to primarily use a damp cloth or towel to remove the dirt, dust, and debris. This particular question is one of the most common, but can also vary depending on the brand, manufacturer, and the quality of the battery. With that said, the shortest battery life that we encountered with our research is batteries that only last about 18 holes. Now, there are batteries that can last close to 40+ holes. However, the rechargeable feature allows individuals to easily recharge the trolley and get back on the course in no time. q: Are the wheels puncture resistance? When it comes to the most common wheel material, we discovered that most wheels are made to be puncture resistant and made from an ABS plastic that is highly durable. This is not only incredibly beneficial, but it also allows for individuals to use the trolley without fear that a wheel will lose air or rip while on the course.